LYL | What Does LYL Mean? LYL means "Love You Lots". The abbreviation LYL has a casual, childlike sense. LYL is mainly used as a farewell, often between parents and children, but sometimes also between close friends. It is rarely used between couples who are really in love, except as a joke. 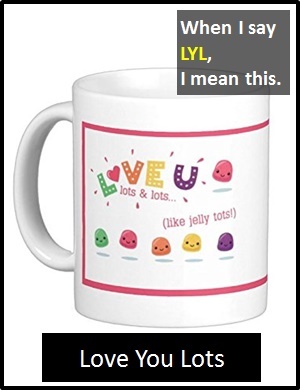 A common reply to the abbreviation LYL is "like jelly tots". This response is of uncertain origin. Of note: The abbreviation LYL is also written as ILYL "I Love You Lots". Tom: Goodnight son. LYL too. Husband: Hello my gorgeous wife. LYL. Wife: Like jelly tots. How late are you going to be? LYL is normally used as a standalone declarative sentence (i.e., a statement). In other words, LYL is not normally used as another part of speech within a wider sentence. Before the digital era, we might have said something like "Love You Lots" instead of using the abbreviation LYL.